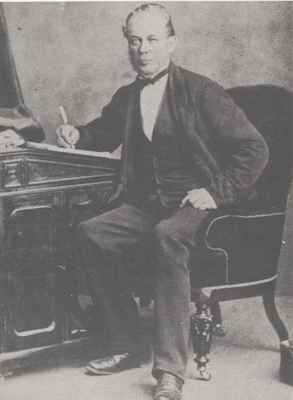 George King Chisholm (1814-1874) was the first Mayor of the Town of Oakville after its incorporation in May 1857. He was William Chisholm's eldest son and the only one of the children to attend the prestigous Upper Canada College in Toronto. He served as Oakville's Mayor from 1857 until 1862. On the original plan this block was designed as "The Market Square." 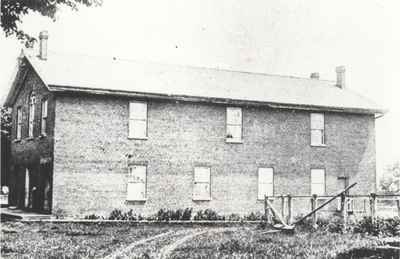 After incorporation, the Town purchased the land in 1859 and first erected a brick structure in to act as a "lock-up" or jail. In 1862/3, a larger, plainly-styled frame and brick building was erected with Council chambers on the second floor. The Town Hall was destroyed by fire in 1911. It was situated on the west side of Navy Street and north of present Bowling Greens.